A cannon has been fired from the Isle of Wight to mark the 100th anniversary of the first shot fired at sea by the Royal Navy in World War One. 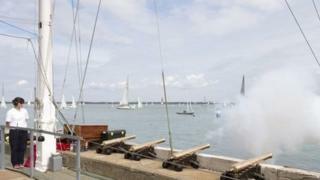 The gun salute was held at the Royal Yacht Squadron in Cowes during a sail past by patrol vessel HMS Mersey. It marked the shot fired from the gun of HMS Lance in the North Sea on August 5 1914. The gun is now a permanent exhibit at the National Museum of the Royal Navy in Portsmouth Historic Dockyard.